Finally, on June 1, 2012, after 3+ months, the Municipality of Talibon harvested 450 kilos net of Tilapia which sold at a total of P26,000.00. This is only a partial harvest. The caught yet smaller sized tilapias were put back in the cages and 2nd harvest is scheduled on the 2nd week of August. Up to partial harvest time, 48 sacks of aqua feeds were consumed starting with 4 sacks fry mass followed by 15 sacks of starter feeds and then 29 sacks of grower feeds. All materials came from the BFAR-RFTC 7 (from fingerlings to feeds and cage materials). 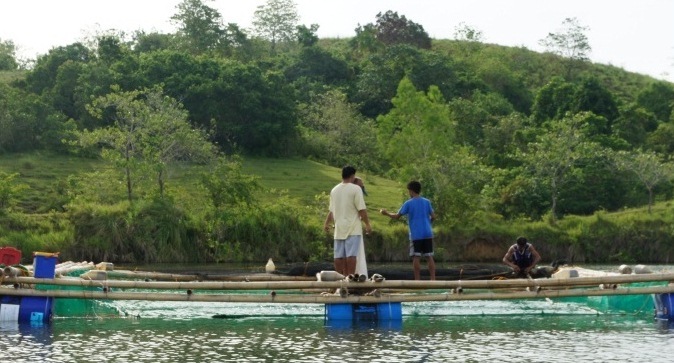 The Tilapia Culture is a joint project between BFAR (Bureau of Fisheries and Aquatic Resources), RFTC (Regional Fisheries Training Center), Bohol Provincial Fisheries Office at Tagbilaran City, the OPA (Office of the Provincial Agriculturist) and Talibon LGU. Before the tilapia culture was started, the San Roque ISA (Irrigators Service Association) chaired by Mr. Hermogenes Auxtero, underwent intensive 5 days training last February 6-10, 2012. The members were trained on how to install the fish cages and how to monitor or participate in the day to day operations of the project. 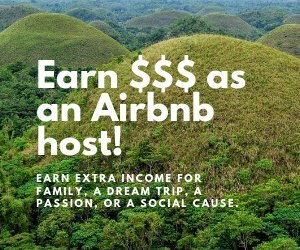 Their labor is the required counterpart to BFAR’s material dole out. 1. The Association shall sustain the operation of the project. 2. The ISA shall set aside the cost for the feeds and fingerlings out of the gross income for the next cropping. 3. The ISA shall retain 30% of the net income in the coffers of the association for the maintenance and subsequent expansion of the project. 4. The ISA shall maintain a record of operation of the project and submit to the MAO for submission to the BFAR-RFTC including production and income. The ISA members were also trained on entrepreneurial skills; how and where to market the tilapia after the harvest and how to maximize their income in the process. Now, the association is looking forward to the 2nd harvest in order to finally gauge how much would their share be; to find out whether tilapia breeding is a lucrative business. 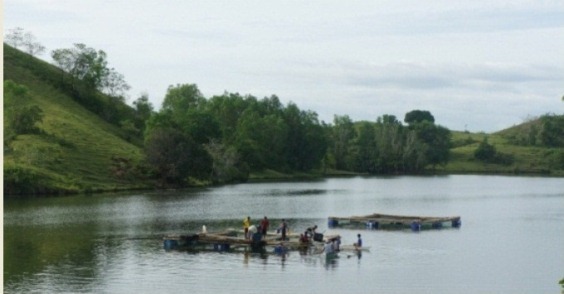 The tilapia culture was started last February 23, 2012 at San Roque Dam in two modules. About 10,000 fingerlings were put into the cages and henceforth monitored. Tilapia is a popular fish food and has been introduced in many parts of the world and is now found in the wild on all continents except Antarctica. It is adaptable to brackish and salty waters and has been introduced worldwide to combat mosquitoes and aquatic weeds. Due to its adaptability, it has become problematic invasive specie in several countries. To provide for the protein needs of the populace, Tilapia has been chosen for production because of its adaptability and fecundity. It is 3rd to seaweeds and bangus in mass production and the market price is now on the level with fishes taken from the sea. 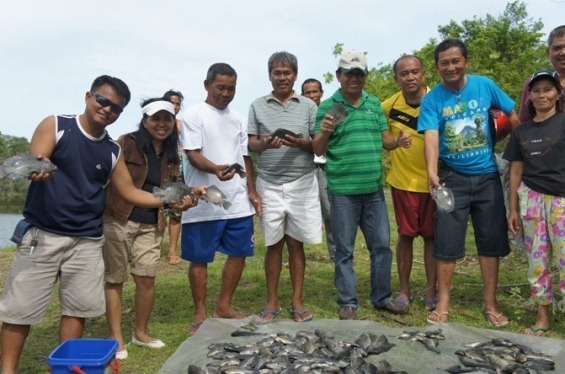 Upper photo shows Mayor Restituto B. Auxtero (in striped green polo shirt) holding up a tilapia. He is accompanied by his Executive Assistant, Mr. Apolinario E. Artiaga (in blue t-shirt). 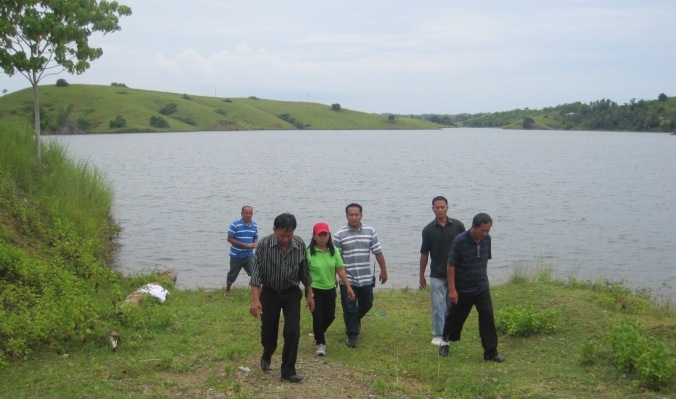 The Municipal Agriculturist, Mrs. Ponciana Cruda (second from left and with white visor) and Mr. Esteban Payusan, the Fishery Community Organizer of the Office of the Provincial Agriculturist (the one in yellow) were present during the harvest. Do you know that the tilapia is also known as “St. Peter’s Fish”? Yes, it is the same fish variety that was caught by St. Peter the Apostle during the miracle fish catch at the Sea of Galilee. This is what my own mother learnt when, together with my father, they went to Jerusalem and was baptized at the Jordan River and was served a “St. Peter’s fish” in a restaurant and it turned out to be no other than a ….. tilapia! Who knows? Tilapia may be a “blessed” fish!! !